2016년이 거진 끝나간다. 올해는 세계적으로 부침이 많았다. 무엇인가는 새로 시작했고 다른 무엇인가는 끝을 맺었다. 이번 포스트에서는 지난 한해를 정리해보려 한다. 나에게 중요했던 일과, 덴마크를 비롯해 전세계에 영향을 미친 사건을 적어보련다. 올해 좋았던 사건으로 처음 꼽고 싶은 일은 <네이키드덴마크>에서 활동을 시작했던 것이다. <네이키드덴마크> 안상욱 선임 에디터겸 공동대표가 나에게 처음 아이디어를 들고 왔을 때가 아직도 기억난다. 고백하건대 사실 당시에 나는 <네이키드덴마크>가 잘 될 거라고 생각하지 않았다. 그냥 그에게 행운을 빌어줬을 뿐이다. 나중에 안 대표가 덴마크어 인강을 만들자고 제안했다. 두 번 생각할 필요 없이 나는 그 자리에서 바로 승락했다. 내가 지금껏 내린 결정 가운데 가장 훌륭한 결정이었다. 훌륭한 학생을 얻은데다가 멋진 친구이자 룸메이트를 만났기 때문이다. 바로 장혜로 언니다. 6개월 동안 40편이 넘는 영상을 촬영했다. 아직 공개하지 않은 덴마크어 인강 수업이 많으니 계속 지켜봐주길 바란다. 페이스북을 보면 낯선 사람들의 대화를 엿듣곤 한다. 그럴 때마다 회자되는 얘기가 있다. “2016년은 역사상 최악의 해”라는 말이다. 사람들은 세계대전과 흑사병 같은 사건를 잊은 듯하다. 2016년 타계한 이 가운데는 덴마크 위인도 있다. 내가 모든 위인을 기억하지는 못하니까 제일 중요해 보이는 2명만 소개하겠다. 첫 번째는 93세로 타계한 앙케르 예르겐센(Anker Jørgensen) 전 총리다. 그는 두 번이나 덴마크 총리직을 지냈다. 당신이 정치에 흥미가 있다면 이 사람이 덴마크 정치에서 굉장히 중요하다고 말해주겠다. 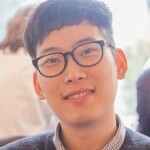 덴마크 정치의 과거와 현재와 미래에 모두 영향을 미친 사람이다. 또 다른 사람은 78세에 타계한 모퍼(Mopper)다. 유명한 덴마크 권투선수 미켈 케슬러(Mikkel Kessler)의 모친으로 리얼리티쇼 브리겐에서 온 가족(Familien fra Bryggen·The Family from Bryggen)에서 중요한 역할을 맡았다. 개성이 뚜력하고 늘 생기 넘쳤던 그는 언제나 덴마크인에게 기억될 것이다. 올해 이 땅을 떠난 모든 사람에게 명복을 빈다. 모두가 평화롭게 잠들기를 바란다. 명복을 빈다고 하니 생각난다. 덴마크 질랜드 지역 코르쇠라는 마을에 사는 한 가족은 6개월 만에 실종됐던 딸의 주검을 발견했다. 크리스마스 전날 밤에 말이다. 고통스럽겠지만 이것도 나름대로 평화를 찾는 길이리라. 17세 소녀 에밀리에(Emilie)는 2016년 7월 어느 밤 친구들과 외출한 뒤 영영 집에 돌아오지 못했다. 이 사건은 덴마크 전역을 뒤흔들었다. TV 뉴스와 신문, 페이스북이 도배됐다. 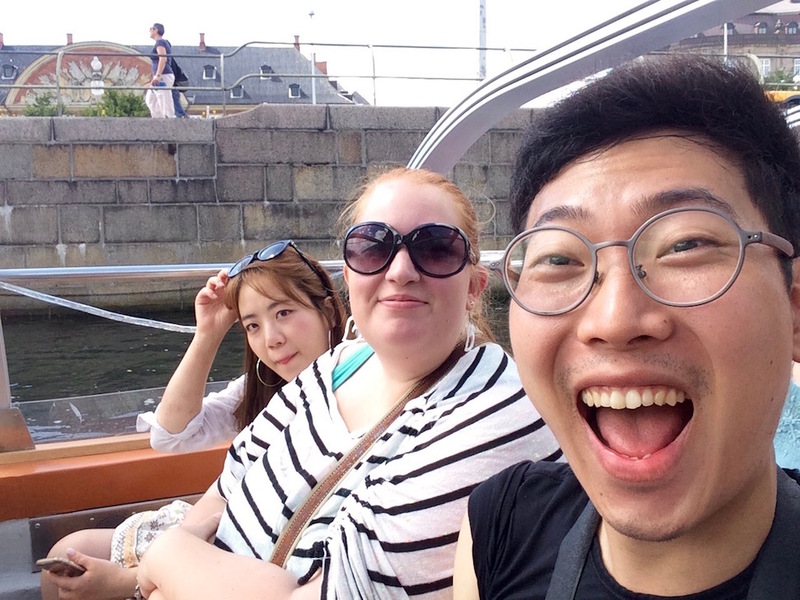 지난 크리스마스 이브에 개를 산책시키던 사람이 강에서 에밀리에의 시신을 발견했다. 에밀리에는 몇 달이나 강 속에 있었다. 그가 발견됐다는 소식도 뒤늦게 보도됐다. 경찰이 범인을 잡으려고 보도 시기를 늦췄기 때문이다. 덴마크인이 슬퍼한 이유는 그가 숨진 채 발견됐기 때문만은 아니다. 에밀리에가 발견된 강은 쿨러럽(Kulerup)과 (Borup)이라는 작은 도시 근처다. 이곳 주민은 외출하기가 두렵다고 토로한다. 원래 그 강은 한밤 중에도 안전하게 산책할 만한 장소였다. 그러나 살인범이 잡히기 전까지 주민들은 그 산책로가 안전하지 않다고 생각할 거다. 많은 덴마크인이 이 격언대로 산다. “이런 일은 나 말고 남한테만 생긴다.” 음 나는 그 ‘남’으로 자랐지만 아직 살아 있다. 때로는 포기하고 싶은 정도로 힘든 순간도 찾아온다. 지난 12월이 그랬다. 원체 12월을 좋아하지 않았지만 올해는 특히 심했다. 어느 날은 경찰관이 내 집 거실에 들어와 내 잠을 깨웠다. 내가 살던 건물 1층에서 총격 사건이 벌어졌기 때문이었다. 다행히도 나는 3층에 살았다. 그날 밤 죽은 사람은 없었다. 한 사람이 총에 맞긴 했지만. 하지만 총격 사건은 최악의 일주일이 시작됐음을 알리는 서막일 뿐이었다. 그 한 주 사이에 내가 사는 동네에서만 3건의 총격 사건이 터졌다. 이제 나는 페이스북을 들여다보기조차 싫다. 세상이 너무 거칠게 돌아가기 때문이다. 12월27일 한 사람이 동네 적십자(Røde Kors)에 옷가지와 신발, 수류탄을 기증했다. 제대로 읽은 것 맞다. 수류탄 말이다. 당신에게 겁주려고 이 포스트를 쓴 건 아니다. 단지 일깨워주고 싶었다. 삶을 미루지 말자. 어디에든 위험은 도사리고 있다. 심지어 도널드 트럼프가 다음 미국 대통령으로 꼽히지 않았는가. <반지의 제왕: 두 개의 탑>에서 샘이 프로도에게 한 말을 기억하는가. 모르겠다고? 이런 대사다. 당신에게도 이 바람을 전한다. 새해 복 많이 받기를, 하늘에서 더 많은 햇살이 당신을 비추길 바란다. 늘 건강하고 삶을 즐기길 바란다. 못된 사람이 당신의 행복과 모험을 방해하도록 내버려 두지 말라. 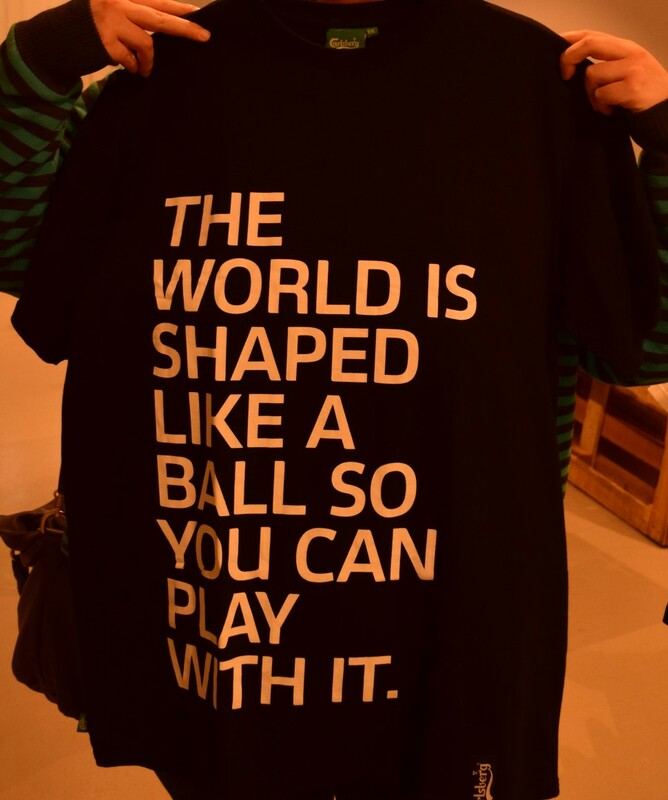 One of the many different kinds of t-shirts that you can find in the shop. The texts are always related to football or beer. The year of 2016 is pretty much over. It’s been filled with ups and downs all around the world. It’s been the beginning of something and the end of others. I wanna share some of these moments that has affected not only me but Denmark/rest of the world as well. To start this piece with something good that has happened this year is the beginning of Nakeddenmark. I still remember when our chief editor and co-founder Sang Uk Ahn told me about the idea. I will admit I was a bit skeptic about it but I did wish him good luck. Later he asked me to make the Danish video classes. Without thinking twice about it I agreed to do it and it’s been one of the best things I have ever decided to do. Not only did I get a great student but also an awesome friend/roommate in Haero. Doing 6 months we made over 40 videos so please stay tuned. When I look on facebook, listen to strangers conversation when I’m out there’s one thing that comes around again and again. 2016 must be the worst year in the history. I think people are forgetting about the world wars, the black death and so on. This is the year where we lost a lot of wonderful and important people. Let’s take a look at some of the people we lost this year. Among some of these people, you will also find some important Danish people. Since I don’t know everyone I will pick out two for you that I find very important. The first one is Anker Jørgensen(age 93) who was our Føj til ordbog twice. If you are very interested in politics then I will tell you he is important for the past, present and future politics in Denmark. The last one is known under the name Mopper (age 78). She is the mother to our famous boxer Mikkel Kessler. She was also a big part of the reality show – Familien fra bryggen. She was full of life, personality and will defiantly be missed. Rest in peace to all the people that left the earth this year. I hope you have found the peace you need. Talking about peace then I know that there is a family in Korsør, Sealand, Dk that after missing their daughter for 6 months finally got some peace Christmas eve even though it also came with pain. In July 2016 a 17-year old girl named Emilie never came home from a night out with her friends. It affected the whole of Denmark. She was on the news, newspaper and facebook all the time. On Christmas eve a dog walker found her body in a lake. She has been in the lake for months and because the police really want to catch the person(s) the won’t release any news. Not only are people sad that she is dead but since the lake was close to a small city called Kulerup and another is Borup people are scared to go out. It used to be a place where you could go around in the middle of the night and be safe. But until the murder has been caught the people won’t feel safe. In Denmark a lot of people are living by the saying – It only happens to the neighbors not me. Well, I grew up being that neighbor and I’m still standing. There are times where you wanna give up. For me it was December. I’m already not a big fan of December but this year was the worst. I literally woke up one day because there was a Police officer in my living room. There had been shouting’s in my building on the 1st floor. luckily I lived on the 3th floor. Nobody died even though one got shot. It turns out that was gonna be the first episode in my area just that week. We had 3 different shooting episodes in my area in one week. Now I don’t even wanna look at facebook cause the group is always going wild. on the 27th a person donated clothes, shoes, and hand grenades to our local Røde Kors. This article is not to scare you but to remind you don’t postpone living life. There is danger everywhere we go. Even Trump got selected as the next president. Remember Sams speech to Frodo in Lord of the rings – the two towers? no ? How can the world go back to the way it was when so much bad has happened. But in the end only a passing thing, this shadow. Even darkness must pass. A new day will come. And when the sun shines it will shine out the clearer. […] Because they (people) were holding on to something. […] That there’s some good in this world…. And it’s worth fighting for. 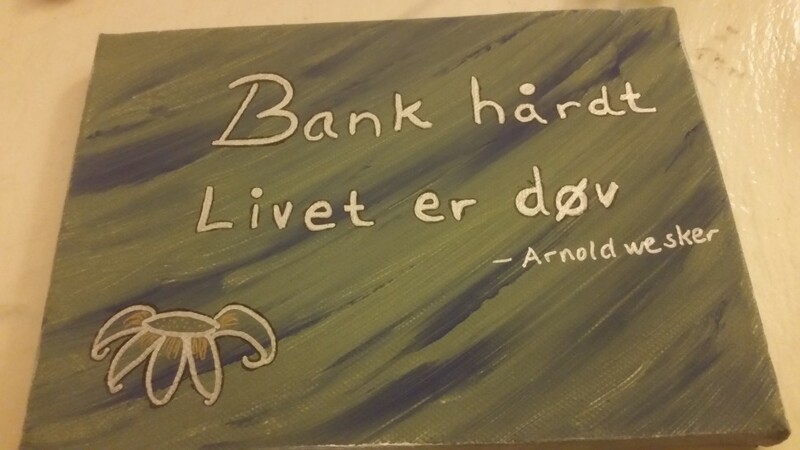 This is a handmade picture with the quote – Knock hard, Life is deaf – Never give up. døv는 귀머거리를 지칭해요. 벙어리가 아니라… 🙂 그래서 문을 세대 두드려야 한다고 한게 아닌가 싶은데요? 댓글 달아주셔서 감사합니다. deaf를 벙어리로 잘못 번역했네요. DK님 덕분에 고쳐 적었습니다.